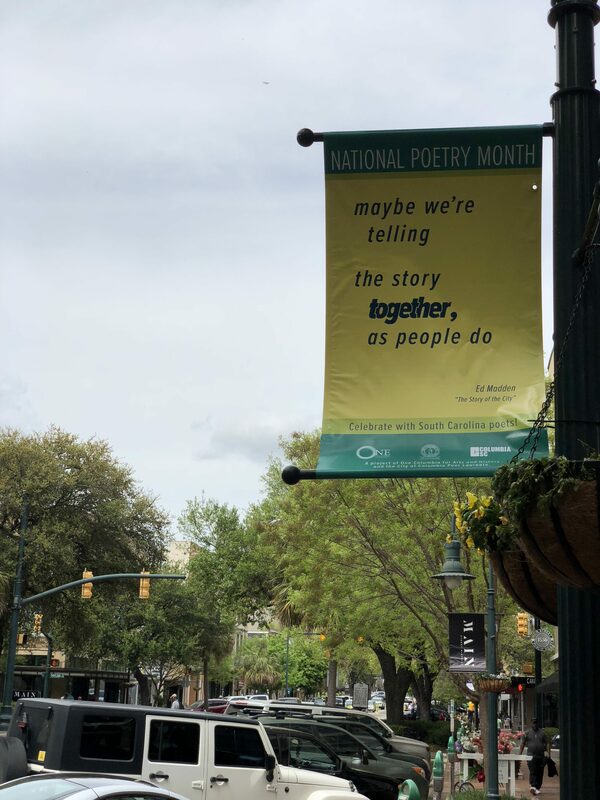 April is National Poetry Month and this year’s recognition took many forms. While we didn’t pull pranks the same way as last year, we worked hard to get poetry out to as many people in their daily lives as possible. 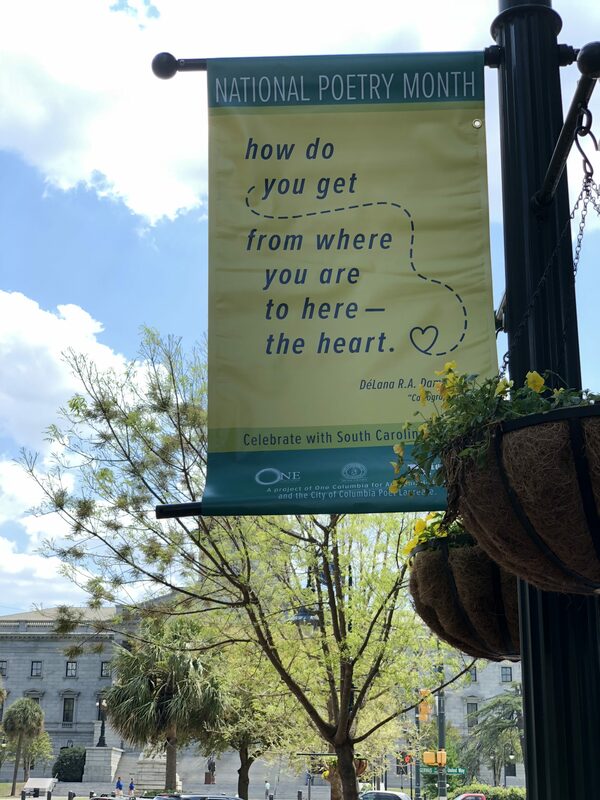 Through partnerships with the Comet, Indie Grits, Main Street District, Enjoy SC and Soda City, we were able to feature poetry in a public setting in a variety of ways. Poetry on the Comet – In it’s third year, the Poetry on the Comet project brings together 30 different poems by authors from Columbia and South Carolina based on the Indie Grits 2018 theme “Two Cities.” Poetry has been posted prominently on the buses, was shared daily on Ed Madden’s Facebook page and is being published as a chapbook. 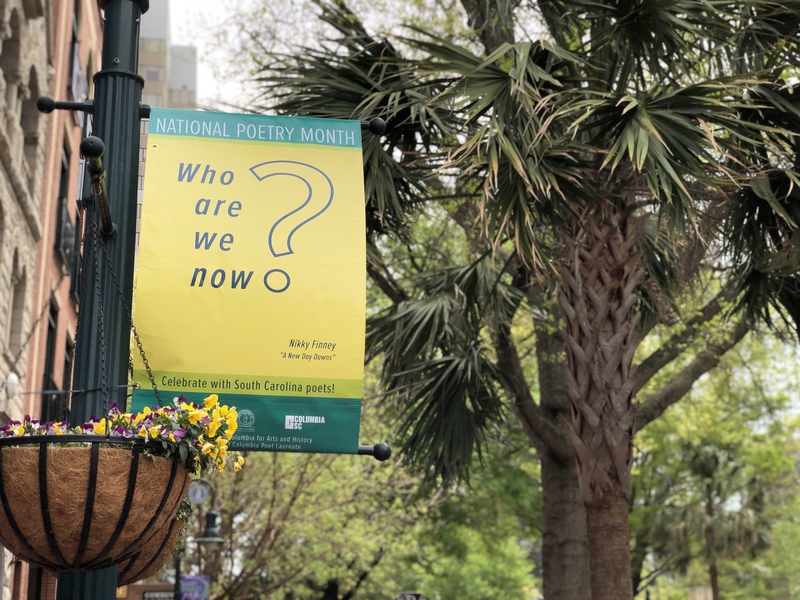 Select poems were also displayed on screen during the 2018 Indie Grits Festival. 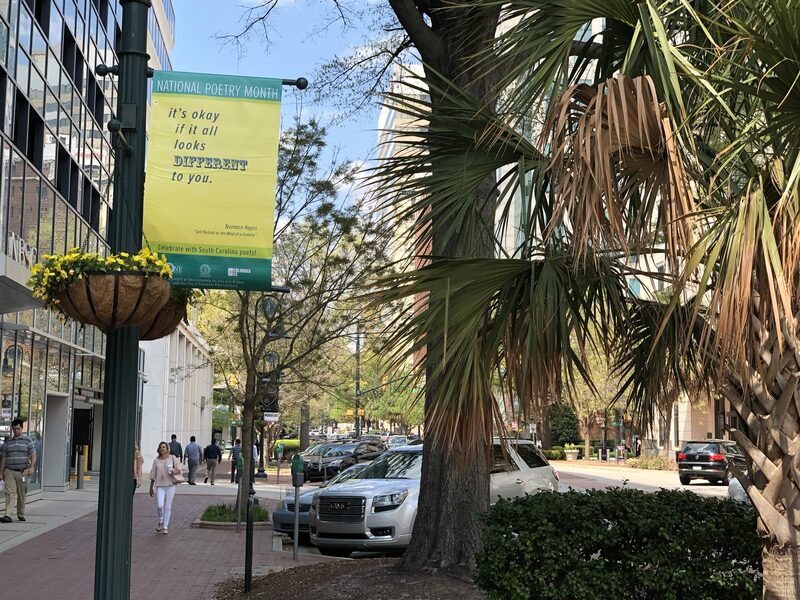 Main Street Banners – Poems by eight South Carolina poets were displayed on banners along Main Street for the month of April. The selections include phrases by James Dickey, Susan Laughter Meyers, Nikky Finney, Ed Madden, Ray McManus, Terrance Hayes, Marjory Wentworth and DeLana R.A. Dameron. 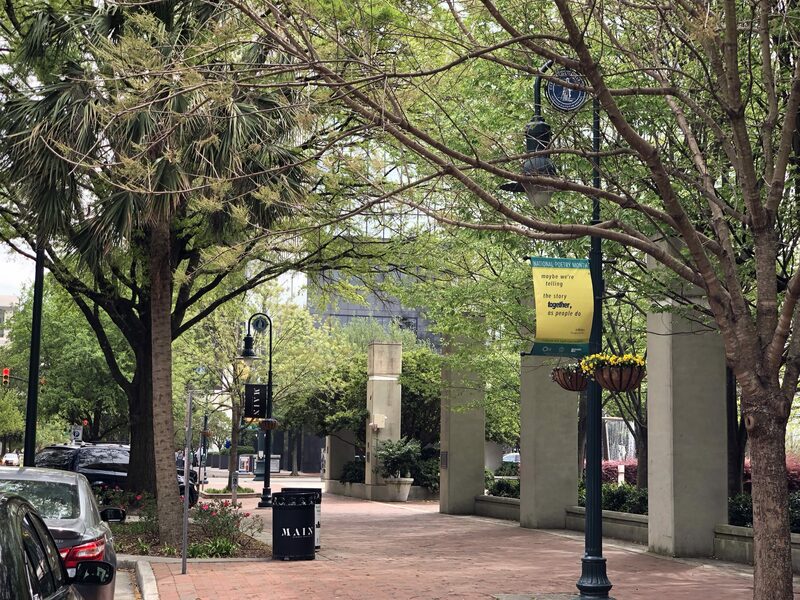 Free & Clear – Similar to the ubiquitous Little Free Libraries that families host in their yards throughout the city, poetry boxes are being hosted in neighborhoods across Columbia and offer free poems about homeownership and community. Passersby are offered the chance to take home a poem of their own. EnjoySC: Make Poetry at the State House – Hosted by One Columbia for Arts & History and Ed Madden, Columbia’s Poet Laureate, in partnership with the City of Columbia through a Knight Cities Challenge Grant, the Enjoy SC: Make Poetry event featured poets from across South Carolina reading poetry on April 18 and April 21 . Attendees consulted with poets on-site who will type a take-home poem on typewriters. It took nine months of work. Painting the wall, he carved out a tunnel, hung the sun in front of us. Nine white overhead lights lead us through the tunnel to the other side. We did not deem it desirable, at this time, said Kelsey & Guild in 1905, to place too much emphasis upon detail, because, in doing so, the main objects sought might easily be lost sight of. The details of the mural trick the eye, the real stone merging with the fake, the real metal barriers beside the painted traffic signs. The things that seem to block the way are the things that make you see. The real windows on the wall look fake, become part of the painting: the vision of what’s beyond is the point. Cities have awakened, wrote Kelsey and Guild, to the urgent need for a systematic plan for [the] future. A comprehensive plan for development, said Kelsey & Guild, should consider well the tendencies of growth, and the physical features that … govern such growth. Two white arrows show both lanes going forward, no one is headed back. It is not clear, really, if the sun is rising or setting. My first few weeks in Columbia, a friend drove me over to see it, early evening, the moment the tunnel seems most real, as if you could drive into it. The sun is the same size as a yellow traffic sign that warns of a right turn ahead, the road curving away and out of sight. Forty years ago, he warned us of a hard swerve to the right, something we couldn’t yet see. It is quite possible, Kelsey & Guild admitted, that this report will be more useful in its suggestions that in the plan outlined. Blue Sky told People magazine, I wanted to reach through that wall, touch something larger than life. Rumor is a kid once drove right into the mural. 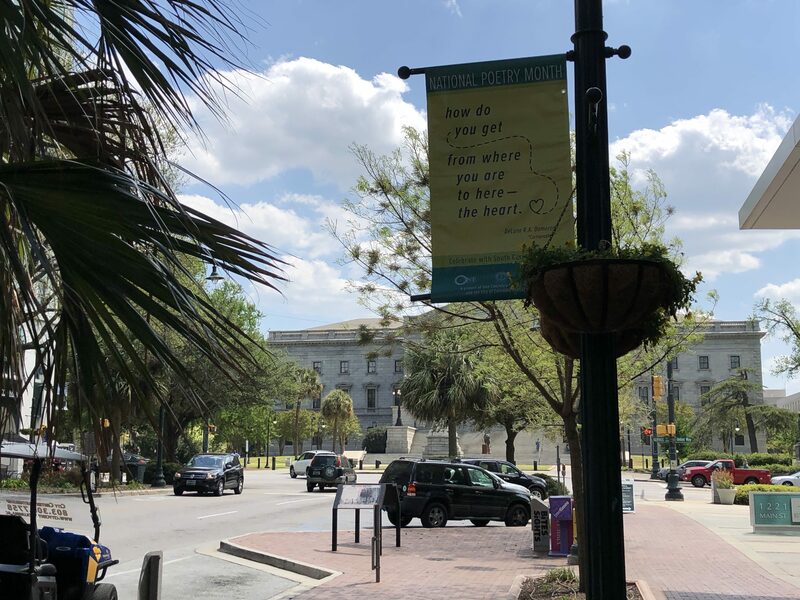 The South Carolina Encyclopedia reminds us that Kelsey and Guild’s proposals were too ambitious to receive serious consideration, but they set a precedent for comprehensive planning. the things that help you see. The wall was a way out. the sun is shining in front of us. In fall 2015, poems appeared on Columbia’s buses, telling the stories of the city. 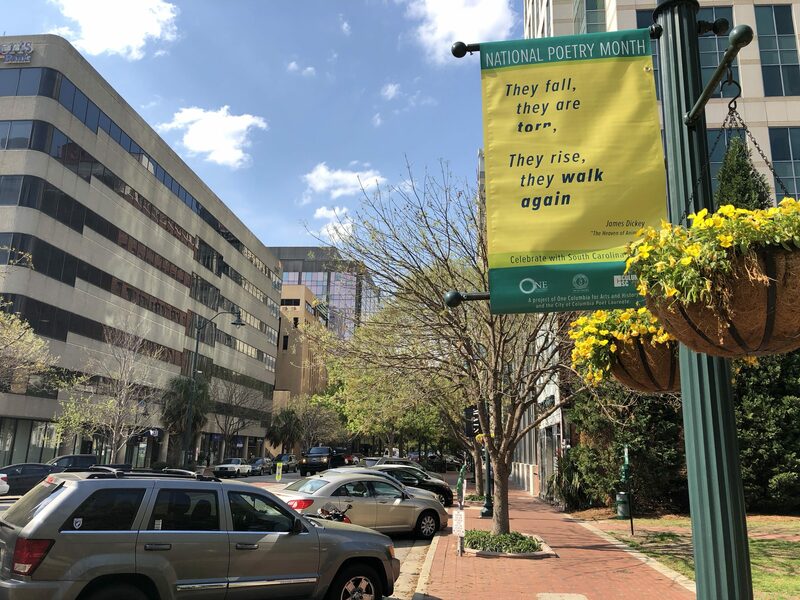 In spring 2017, we saw poems about rivers posted on city buses and on movie screens during the Indie Grits Waterlines film festival. This year, we’re looking for poems about how we experience the city, what separates us and what unites us. We’re thinking about the Indie Grits theme for 2018: “Two Cities.” We all live in the same city, but we work and live in the city in different ways. We experience the city in different ways—its landscapes and streets, its neighborhoods, its social and political spaces. What are the frontiers of your city? What spaces define your experience? What social events, what networks, what communities are your city? How do race or socioeconomic factors define your experiences and interactions within our shared city? What spaces are accessible? How has your world been shaped by gentrification, accessibility (including access to the arts), housing displacement or development? by sidewalks and libraries and green spaces? By churches and community centers? By railroad tracks and speed bumps and traffic lights and bus stops? How do we make our city more open, more inclusive, more welcoming? How do we have difficult conversations? How do we break down barriers, make things more accessible, express and experience empathy? 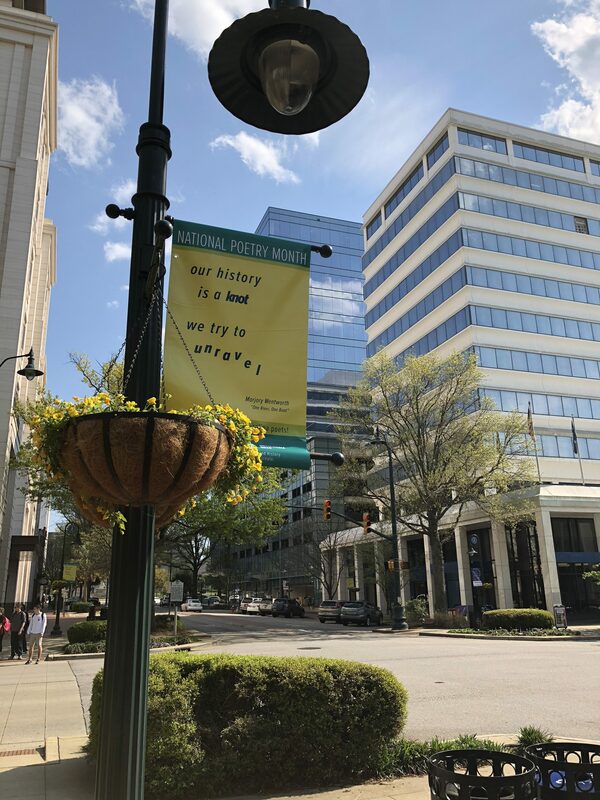 Because this year’s Indie Grits Labs are focused North Main, we are especially interested in poems by writers from North Main neighborhoods or poems about Main and North Main. Poems should be 10 lines or fewer & should address the theme. Submit your poems to poetlaureate@onecolumbiasc.com by Feb 15, 2018, for consideration. dark, when it’s still so cold. Ed sits down to chat with Curtis Rogers of the SC State Library for episode 39 of their podcast LibraryVoicesSC.